Exciting News. This week Google released a bunch of updates to many of their tools that are popular with teachers. Here's a short overview of those updates which I think many of you will be excited about as well. I have heard several teachers over the past couple of years mention these updates as a must fix for Google. Now they have. When school gets back in sessions, I will gladly offer training on how to take advantage of these updates. 1. Google Classroom now supports sharing with parents. You can now invite parents and guardians to subscribe to a daily or weekly summary of activities in your Google Classroom classes. 2. In the Google Classroom mobile apps you can now draw on, highlight, and write on top of students' Google Documents, PDFs, and Microsoft Word documents. The iOS version of the app will also let you type on top of a document. With both apps students can annotate items that teachers have shared in Google Classroom and teachers can annotate items that students have shared back to them. 3. You can now use images as answer choices to questions created in Google Forms. You can also use images as question prompts in Google Forms. 4. You can now add topics labels to posts in your Google Classroom stream. This allows you to search and sort your stream by topic instead of date. 5. Starting on September 12th Google will no longer offer Hangouts on Air. Hangouts on Air will be replaced by YouTube Live. YouTube Live will let you create public, private, and unlisted broadcasts. Broadcasts will be automatically stored in your YouTube account. The most significant change for many users will be the removal of the Q&A feature that was in Google Hangouts on Air. Now to host a Q&A you will have to share Google Slides and use the Q&A feature integrated into the presenter mode in Google Slides. For those that are interested, check out this free home edition download at https://www.dyslexiefont.com/ This is a free font that has been proven to help with reading for dyslexia. OpenEd is a service that offers a huge catalog of standards-aligned lesson plans and other resources for teachers. 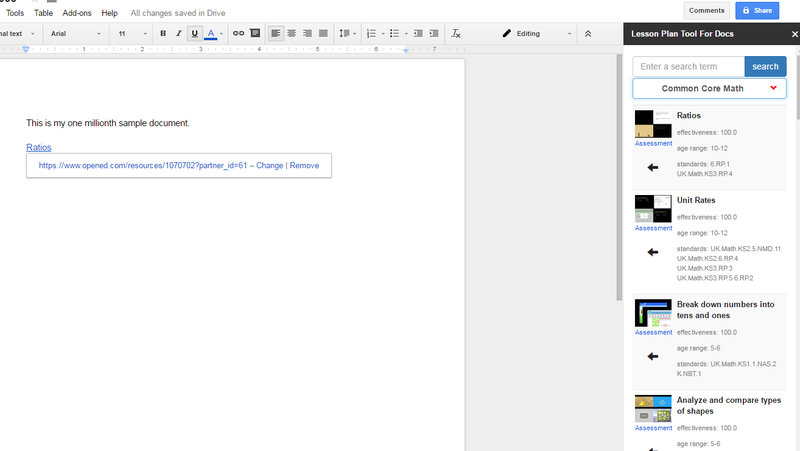 Today, I received an email from OpenEd informing me of their new Google Docs Add-on called Lesson Plan Tool for Docs. With Lesson Plan Tool for Docs enabled you can search for standards-aligned lesson plan resources within your Google Documents. To perform a search simply open the add-on then select a standard from the drop-down menu that appears on the right-hand side of your document. You can preview any of the resources that appear in the search by simply clicking on them and opening them in a new tab. When you find a resource that you like, you can click again to add it into your document. Lesson Plan Tool for Docs could be a handy Add-on to use when you're developing units of study for your classroom. You could share the document onto which you're adding resources so that your colleagues can help you create a unit of study. Have you ever been working on a document and wished that you could find a great quote from an authoritative figure to add to it? 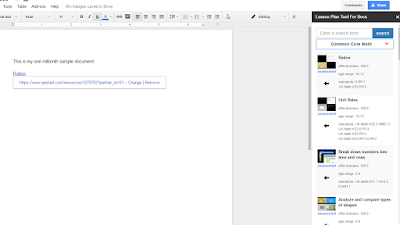 Normally, this sends people over to their nearest internet browser to search for a quote, but there’s a way to find great quotes right within Google Docs itself. In Google Docs, go to Tools > Research. In the search menu, select Quotes from the dropdown menu. Search for a quote, either by the author or a keyword. To insert the quote into your document, put your mouse over the quote and click Insert.